Someone was asking about "microblogs" the other day, whether Posterous.com is a platform that small nonprofits should be looking at, and how it might be used by organizations that already maintain a blog on their website. Here are my thoughts on it. I'd love to hear yours, too, in the comments. If your nonprofit organization needs to set up a blog instantly and/or temporarily, perhaps for sharing information around a time-specific issue, Posterous may be just the ticket. Quick to set up and easy to use — if you’ve got email access, you’re good to go — and there’s no cost or commitment. To begin with, there’s no sign-up process with Posterous, and no software to install. Simply write your first blog post and email it to post@posterous.com. Posterous will email you back with a temporary web address for your new blog, in the format of username.posterous.com. You can accept the default username (it’s based on your email identity) or take the option to choose another blog address — or, with a little bit more time and tech savvy, set up a custom domain (e.g. yoursite.com) to point to your Posterous blog. Choose a password (recommended but not required), and, if you like, edit or delete your first post.The welcoming email will give you direct links to these functions. You can also choose to add a tracking code for Google Analytics, grab your RSS feed to run through FeedBurner, integrate with a Twitter client, or customize the look and feel with a built-in theme or custom CSS — but those refinements are totally optional. One of the strengths of a Posterous microblog is how quickly and easily you can update it. You can post fresh content to your blog directly via the web interface, of course, but I’ve found that option is about two clicks away from being truly convenient. 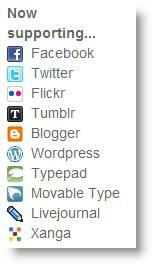 Much more useful is the bookmarklet (a scrap of code you store in your browser Favorites, to click on whenever you see web content you’d like to quote or share on your Posterous blog). Blogging by email is where Posterous rules, however. Good news for mobile users! When you email a blog post to Posterous, you can attach images, videos, web links, PDFs, mp3 audio files, documents or just about any other kind of media you might want to share in a blog post — Posterous somehow knows what to do with them all, and will include those assets in your blog post in the most web-friendly format it can. In practical terms, that means you can email a photo straight from your camera phone and Posterous will automatically resize the image and post it to your blog, along with whatever text you choose to include. Are you starting to get some ideas for how your nonprofit might use Posterous? Think of international field workers and activists in the world’s troublespots, with time or technology limitations that limit their access to conventional blogging platforms… but also, just consider the ease with which you could “live-blog” your nonprofit’s events and community projects. Posterous lets you run a group blog with multiple authors. For those who need to post breaking news on the fly — and especially for a temporary site around a specific, immediate issue — Posterous is a great match. It’s worth noting that a group blog gets to setup its own user “profile,” by the way, so you don’t need to choose a specific staff person or volunteer to be the public face of your organization at Posterous — one of the long-time grumbles from organizations on Facebook before the new improved fan Pages came along! 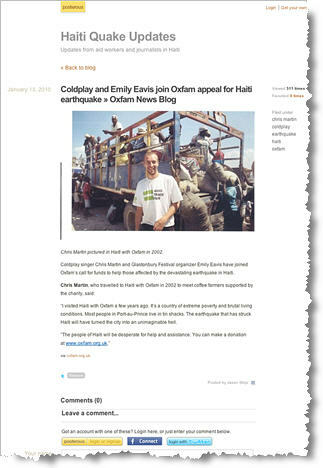 For a timely example of a group blog on Posterous, have a look at Haiti Quake Updates, which was set up yesterday, January 12, 2010, to provide updates from journalists and aid workers in Haiti, in response to the devastating earthquake there. You’ll notice how it acts as a public information service to engage people in the plight of Haitians, but also as a gentle and unobtrusive way to highlight Oxfam’s relief efforts in Haiti and the organization itself. Is this a blogging model that might work for your own cause? Your Posterous blog can be setup autopost to a number of social media sites: Twitter, Facebook Pages, most of the major blogging platforms, and many other supported networks. One email sends your content to all your “outposts” at once. And Posterous.com itself is a networked system, where other Posterous users can easily subscribe to blogs of interest, and discover new blogs by seeing what other users subscribe to or who subscribes to them. You can also add tags to your posts, to help others find them through Posterous on-site search, or browse tags to find new information of interest to you. Explore a few tags — nonprofit, for example — to see what kind of content other users are posting, and see what ideas come up! Perhaps you could use a quick-and-easy “side blog” to highlight stories that don’t quite have a place to fit on your organization’s website, or to give your constituents a semi-official way to share their stories without adding a great deal to your staff workload? Take the Delware Humane Association for example: their website has an integrated blog for official-type News, but they’re also posting to Tales About Tails on Posterous, with a lighter tone, many more cute pet photos, and an invitation right in the header for clients to share their success stories about adoptions from the DHA shelter. The official site remains appropriately formal (or as formal as it gets, with pictures of kittens) while the side blog shows off the warm fuzzy side, personalizing and telling the real-world stories of the work of the organization. There you have it — just a quick introduction to Posterous.com and a few ideas for how a Posterous blog might be used to advantage by nonprofits. You probably have a dozen other ideas, and I hope you’ll share them in the comments. Does your nonprofit use a Posterous blog as one of your social media "outposts"? This is a great outline of how Posterous might be useful to small nonprofits, as well as the step-by-step directions for putting it into place. I'm tweeting this to my followers. Thanks so much for the great info. I've been using Posterous for a couple of months now, and I really like it.Particularly useful for me: the social networking links, so that a topic can be directed to the proper audience. I also use Posterous but would like to recommend folks check out Tumblr too. Tumblr lets you post text, photos, quotes, links, music, and videos from your browser, phone, desktop and email. So, it's a lot like Posterous. And it's free and easy to use. God I sound like an ad! Rebecca, this is one of the most compelling cases I've read for nonprofits to use Posterous. I recently wrote about how Posterous is an overlooked storytelling platform, but it's really an overlooked platform! This will be on my "must read" list I'll hand out, when folks ask me about Posterous. I do use Posterous for some social clubs, and the Group feature is superb. But I would love some API or other method of autoposting to my blog on my Wild Apricot website. Objective being to drive visitors and users back to my WA site. Is Posterous software available free to none profit making businesses? Paul, yes; in fact, Posterous.com is free for anyone to use.